Have you ever wondered what sort of poison is lurking in the sky? 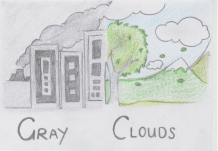 We, Gray Clouds, are here to tell you about the effects of air pollution and about what's in the air we breathe, how to reduce it and to warn other people about its dangers. Air pollution is one of the major problems damaging our planet right now, killing trees, animals and even us humans. We're causing dangers to ourselves by polluting our once clean air. With your help, we may once again breathe clean, crisp air that isn't thick and toxic with the unknown. Pollution is not something we can easily fix, it is a major problem that is in need of our saviour. An OECD reported a statement estimating pollution will become the worlds largest premature killer, killing 3.6 million people annually by 2050. In this current day, places around the globe are already deteriorating due to air pollution. These places include: Linfen, China, Bohpal, India, Central Kalimantan province, Indonesia, Kasargod, India, Dzerhinsk, Russia, Sumgayit, Azerbaijan, Tianying, China, Sukinda, India, Chernobyl, Ukraine, and Arctic Canada. Human activity will leave a toxic stain on our planet, for more information on this topic, click here to see the full report.